Today wraps up my recap of my first bike camping trip. You can read part 1 here, part 2 here or read most of it over at Swift Industry's wanderlust-inducing blog. (Bonus: Photos by Gideon). Day 3 was an early one and the prospect of an easy 40-ish mile ride home made our sunrise departure that much more pleasant. The sunrise group had to get home in order to be at work that afternoon, to finish up graduate school work and to take a nap (yours truly). Our yoga teacher and fellow Swift Navigator was Houston bound for a criterium race, where he ended up placing in the top 10. The final group out took advantage of Bastrop’s Main Street for a second breakfast of chocolate chip pancakes and waffles. It was roughly 120 miles of road, dirt, gravel and hills. 7 pizzas and an uncounted amount of tacos and bagels were consumed. One armadillo sighting. Two campfires and many cups of campfire coffee enjoyed. I’d say we’re pretty ready for Swift Campout 2015. Bring on the Solstice! It doesn't take much to get excited about summer! Swift Industries is kicking summer off in the best way possible- one giant camp out during Summer Solstice. You can read Part 1 of our adventures here. For more photos you can check out what I shared over at Swift Industry's blog here. Day two was for swimming and looking at trees. Arguably the best part of camping is camp coffee and that was in full effect on Day 2. We let the sunrise wake us up and sleepily made our way to our various coffee set-ups. 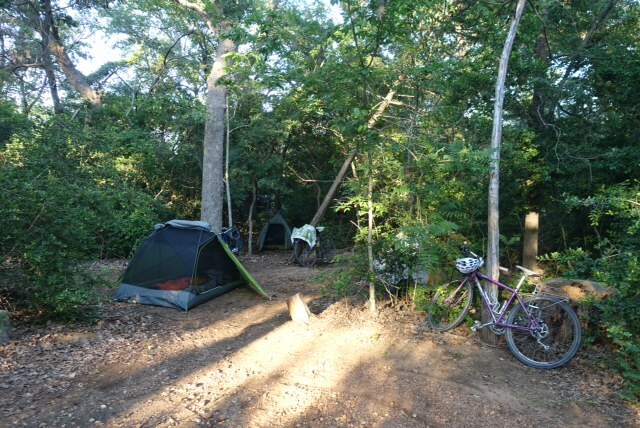 We talked about the various rustling we heard that night and one camper excitedly shared that it was an armadillo bumbling around camp, bumping into our bikes and tents. Not only that, it was the first armadillo she had seen since moving to Texas! We figured it was a good sign, since the armadillo is considered Beat The Clock’s spirit animal. Bye Matthias! He was Austin bound and we met up after the camping trip. As of this post, he's made it to the Grand Canyon. After making breakfast we broke camp and turned our sights back to Bastrop State Park. We said goodbye to our new friends as they headed to Houston and Austin, and we hopped back onto Park Road 1C. Part of the group branched off for a dirt ride into camp while the rest revisited the hills. The camp vibes were strong with us- Bastrop’s pool opened 20 minutes after we arrived at the park. Day 2 was full of burgers, swimming and plenty of lounging. After camp was set up, one of Beat The Clock’s founders led a camp yoga session, using logs as props and attracting some curious stares from the Girl Scout camp set up next to us. For dinner we finished up the pizzas and made a few tacos for good measure. We enjoyed a mellow night following a sun and pool soaked day and turned in early- I think the Girl Scouts were up later than we were. The moon was almost full that night, making our headlamps almost unnecessary. In less than two weeks, Summer will be upon us! What better way to celebrate than with friends, bicycles and some campfire coffee? A group of us set out last month to do some research to find the perfect campsite. Mission accomplished. This week I'll share our adventures in 3 parts- one for each day of adventuring. But if you want to skip ahead, you can read all about it on Swift's Blog. The first weekend in May was beautiful- warm, sunny days and clear, cool nights. A weekend made for bike camping. Thirteen of us gathered to drink coffee and do some reconnaissance work for Swift Industries’ Summer Solstice Campout on June 20th -22nd. It was possibly one of the brightest rides I’ve ever been on. Plus when you infuse Beat The Clock Cycling Club with some Swift Industries, you know good times and camp vibes ahead: Three days of riding alongside ranches teaming with young livestock, past a ghost town and finally through the charred pines of Bastrop sprinkled with new growth. Jolene demonstrates how to fully enjoy a bike ride. We rolled out Friday morning armed with sunscreen and coffee. We took Walnut Creek Trail out of Austin. There were a few stubborn wildflowers still happily showing off and we enjoyed a shaded ride thanks to Texas’ early spring. The gradual incline of the trail was our warm-up and it let us know we weren’t in Austin anymore. We made it to Manor for a quick snack break and then it was on to Elgin for Tex-Mex (and a margarita). Park Road 1C in Bastrop. So. Many. Hills. Fueled up, we headed toward the much anticipated gravel portion of our trip. But before we got to the gravel we had to ride alongside some small ranches. Expecting to be chased by dogs, I was happily surprised that instead we were escorted by cows and their young running alongside the fences as we passed. Then came the gravel, eight glorious miles of it. A skidding competition ensued, taking advantage of a time-out to change a couple of flats. The gravel turned back into road and we neared Bastrop, the suggestion that we “save some for the park road” made its way through our group. Another snack break and then we were at Bastrop State Park. We still had 12 miles of rolling hills ahead of us until we made it to our first night’s campsite in Buescher State Park. The scenery in Bastrop is pretty surreal. In 2011, Bastrop State Park was ravaged by wildfires. All along our route was evidence of that terrible summer- epic pines charred and cut down and bald spots existed in what was once a lush forest. But new growth was everywhere- bright green little pines against the black and grey giants. There were even blackberries growing in abundance. We set up our camp and then split into two parties. Party One set out on pizza duty, while Party Two got the fires going and made friends with three other bike campers who happened to roll through: a German woodworker taking 5 months to ride from Atlanta to Vancouver; and two women riding from San Diego and Phoenix, respectively, en route to Florida. Pizza and beverages were shared among everyone, along with stories and some pretty big goals. Quietly, campers slipped off to their tents and Day 1 was complete.